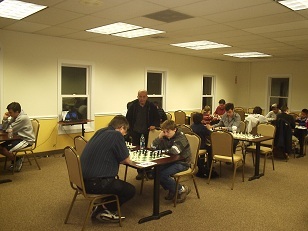 Friday was another exciting night of chess at the Chess Club of Fairfield County. Six players, ranked from unrated to 1400, competed in a swiss section. Rating favorite Justin Blum put in a solid performance and led from start to finish. It was not such smooth sailing in the next quad where top seed Brian Arpie lost to Derrick Xiong in the first round. He did however rebound nicely to finish with two points, tied with Leo Bykhovsky for the win. With three strong masters in the final quad, there was no room for error. NM Daniel Lowinger defeated FM Leif Pressman in round one, and drew NM Ian Harris in two to finish in clear first place.